Twenty years of walking one step behind Nelson Mandela and being the symbol of racial reconciliation have been wiped out in one lousy weekend of Twitter rants. That’s what happened in the Zelda La Grange incident. Ms La Grange was Mr Mandela’s personal assistant, strategically hand-picked by the late statesman precisely because her family history is deeply rooted in the Afrikaner community. The Afrikaners were seen as the driving force behind the brutal racial segregation system of apartheid. The word apartheid comes from Afrikaans, the language of Afrikaners. In the 1976 anti-apartheid uprising, black students were protesting against the use of Afrikaans as a medium of instruction in government schools. This would have meant being forced to learn other subjects such as mathematics, biology, history, geography, etc in Afrikaans. The students held up banners denouncing it as the “language of the oppressor”. It was for this reason that when President Mandela came into office, after serving 27 years in prison, he insisted on hiring an Afrikaner assistant to show the world that he wanted to reconcile black and white communities of South Africa. So it came as a huge surprise when a series of messages from Ms LaGrange’s Twitter account, which has just over 55,000 followers, appeared to downplay the effects of apartheid and colonisation on the majority of South Africans. In one message she wrote: “If I was a white investor I would more or less leave now. It’s very clear from Jacob Zuma whites are not wanted or needed in South Africa”. This message was retweeted at least 463 times and it was favourited 134 times. Ms Le Grange was reacting to a speech by President Jacob Zuma in which he said that South Africa’s problems started in 1652 when Dutch settlers led by Jan Van Riebeeck landed on the Cape of Good Hope. 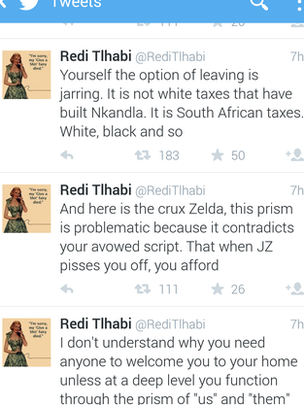 For a brief period Zelda La Grange changed her Twitter name to Zelda Van Riebeeck. The messages created an uproar with black social commentators. The governing African National Congress (ANC) called Ms La Grange “a spoilt white person”. Last year Ms La Grange published a book entitled Good Morning Mr Mandela, describing her years as the Nobel Peace Prize laureate’s personal assistant and what she learnt from it. The book was warmly received and there was general goodwill towards Zeldenia, as her former boss affectionately used to refer to her. This was a sharp contrast to some people who wrote books about their close relationship with the first democratically elected leader of South Africa, and who were criticised as gold-diggers exploiting the Mandela brand name. She, on the other hand, was the darling as she gave inspirational speeches during her book launch tour, talking about the wonderful relationship she enjoyed with Madiba (Mandela’s clan name). Social media law expert Emma Sadleir says, “If you cannot put it on a billboard with a photograph of your face with your name next to it, don’t put it online”. When I interviewed Ms La Grange, a little over a year ago, at the funeral of Nelson Mandela in his home village of Qunu, she told me that he had taught her about forgiveness. But sadly she has undone all the goodwill. I think that Mandela must be turning in his grave. He wanted her to be his messenger of peace in a racially polarised South Africa. She reversed all those years of hard work with a stroke of a social media pen. Posted on 20th January 2015 by newsafrica. This entry was posted in Africa, Mandela Doctrine, South Africa. Bookmark the permalink. « Somalia: The Next Oil Superpower?